Payton was born on March 11, 1999 at 1:10 pm. She weighed 8 lbs 5 oz., and she was 21 inches long. First smiled: March 31, 1999. First laughed: May 11, 1999 (at her Daddy). First rolled over: Back to front: May 23, 1999. Front to back: July 2, 1999. First grasped toy: June 12, 1999. First ate cereal: July 3, 1999. First ate applesauce: July 3, 1999. Found her feet: July 9, 1999. First slept through the night: July 27, 1999. First reached for Mommy: July 31, 1999. First tooth: August 1, 1999. Second tooth: August 7, 1999. First Popsicle: August 15, 1999. 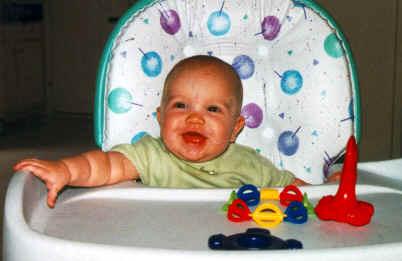 First time to sit-up without support (for more than 30 seconds): August 28, 1999. First time to say Da-Da (over and over again): August 30, 1999. First said Ma-Ma on October 3, 1999. First pulled up on October 8, 1999. First feed myself a bottle on October 12, 1999. First clapped on October 21, 1999. First night away from Mommy and Daddy: November 25, 1999. First waved on December 22, 1999. Started walking the week of December 26, 1999. Started putting two words together: July 2000. First time to use her potty seat: August 26, 2000. 3 months: Weight: 13 lbs. 1 oz. 4 months: Weight 15 lbs. 2 oz. Length: 25 1/4 inches. 5 months: Weight 16 lbs. 6 months: Weight 16 lbs. 3 oz. Length: 27 1/4 inches. 9 months: Weight 18 lbs. Length: 27.5 inches. 1 year: Weight 20 lbs. 7 oz. Length: 31 inches.